Aug. 5, 2018 — In a region known for sunny skies and mild weather, a freak storm hit the Ixtlahuacan de los Membrillos area Saturday, July 28, leaving a shocking amount of destruction in its wake. The storm reportedly claimed the lives of at least two young children, and left a third in critical condition as of this writing a week later. Early news reports offered sparse and conflicting details, with a liberal use of words describing the storm as freak, insane, monster, bizarre, intense. A closer look shows that an uncanny and unfortunate combination of elements came together that night to make a perfect storm of terror and destruction. The storm began suddenly, bringing heavy rain, gusting winds and hailstones up to 7cms in diameter. This year, streets surrounding the plaza had been barricaded, allowing entrance only to those who paid a $30-peso entrance fee. The sheer number of people in the plaza created the first unfortunate element this night. And when the storm hit, the barrricade that held non-payers out, to a large extent also kept the mass of concert-goers in. In other words, their escape routes were largely (unintentionally) blocked. About 20 minutes into the concert, the sky suddenly erupted with rain and hail; some distant lightning in the sky seemed to be the only forewarning. Prior to the onset of the storm, one resident reportedly commented to companions that funnel clouds appeared to be momentarily highlighted within the lightning. Power quickly went out and for more than a half hour (some estimates say approx. 45 minutes) heavy hail rained down at an angle, driven by strong, gusting winds. (See a video by Efrain Hernandez here.) 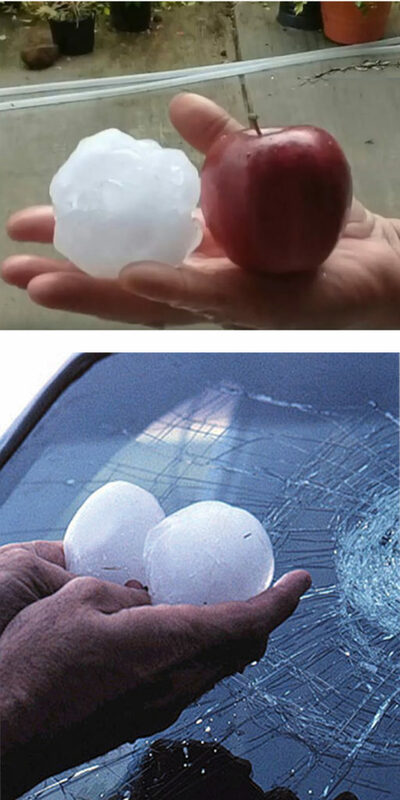 The hailstones were varied in size up to 7 centimeters, roughly the size of tennis balls and baseballs. Interestingly, the hail varied in shape also. 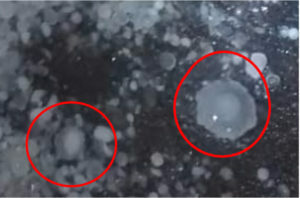 As well as the large but typical round hail, oddly shaped hailstones were reportedly seen. These included pointed “ice cream cone-shaped” and sharp-edged “flying saucer-shaped” hailstones (see photo), that were particularly destructive. Vinyl canopies were quickly perforated and shredded by the onslaught of hailstones, offering little or no protection. Many sought shelter under arches of the Presidencia, where the alarmed people were said to be screaming and shouting out prayers. People also took refuge under an awning located outside the Centro de Salud (Health Center) and forced the locked doors open when the enormous hailstones broke through the (supposedly unbreakable) polycarbonate awning. Elsewhere in the town, and as far away as the north side of Chapala, deafeningly loud hail battered everything within the storm’s path. Building and car windows were shattered, trees and plants were destroyed or denuded of leaves and fruit, roofs and rooftop items like solar panels were damaged while the population anxiously waited in the darkness for the storm to pass. 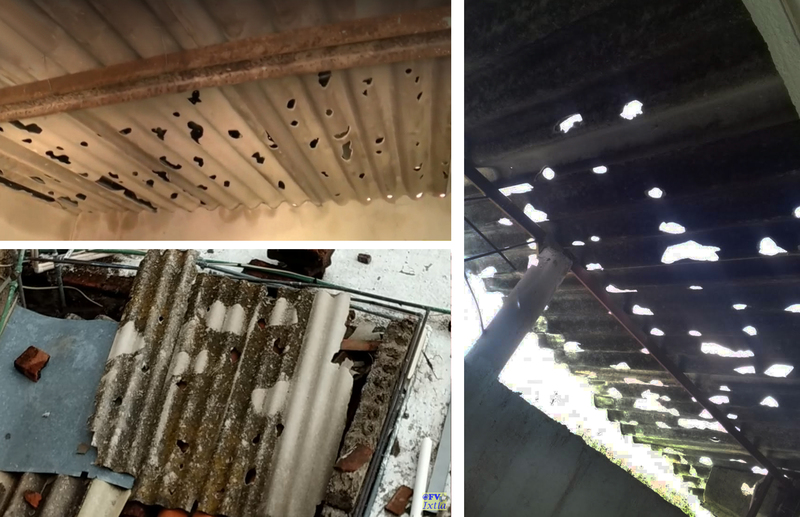 Hail broke through the roofs of houses normally protected by lámina (corrrugated tin or fiberglas panels) or teja (molded clay tiles), bombarding the frightened families huddled inside, along with their household belongings. Unusual and especially dangerous “flying saucer-shaped” hailstones with sharp ridge around icy center. time. Flooding was not widespread, but it did affect some homes and buildings. In the aftermath, area press stated that a 3-month-old baby died after being struck in the head by a hailstone, and that a 4-month-old baby died of suffocation while the mother sought cover. It is not known whether this was two separate fatalities, or a single one with faulty details. Although unofficial, residents also reported the death of a 2-year-old from a nearby town. And, although uncomfirmed, local residents say a 13-year old was trampled by the panicked crowd and remains hospitalized in critical condition. 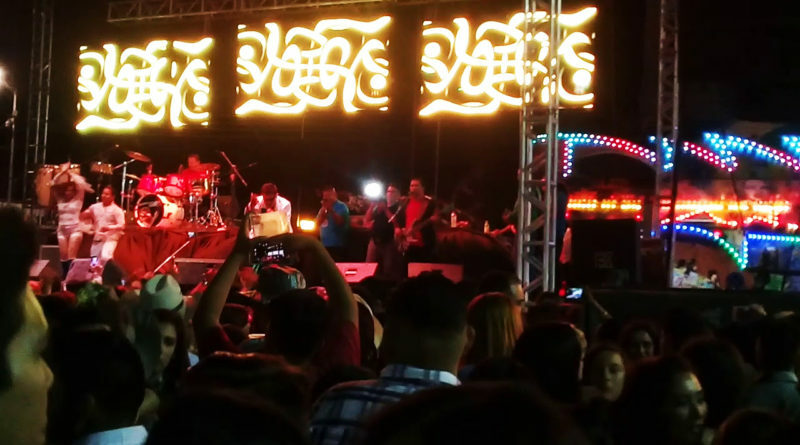 Since the storm, no official tallies of damage have been released, but one city employee reportedly stated damage just to the concert stage and equipment alone was an estimated $1.5 million pesos. A worker at a parking lot near the entrance to Ixtlahuacan reported at least 80 of the vehicles parked in the lot had windshields broken. 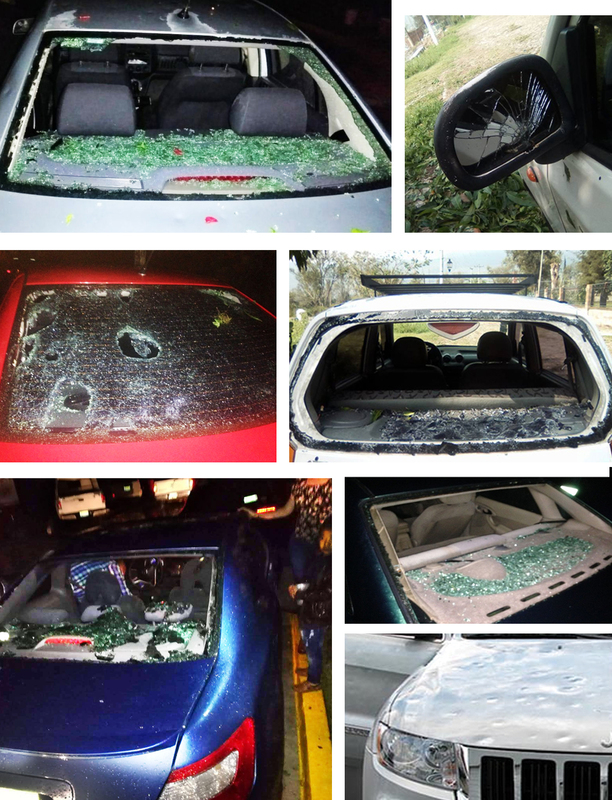 The total number of shattered windshields is conservatively estimated to be at least 150, possibly much more. 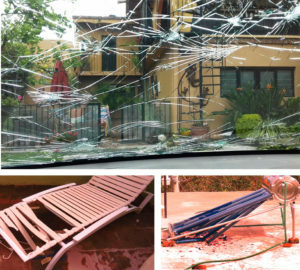 More than 300 residences and businesses were also apparently damaged by hail and water. The full extent of damage may never be known, since residents as well as visitors and vendors from out-of-town rode out the storm. This was not a typical storm, especially for an area where extreme weather is virtually unheard of. The night of July 28 will likely never be forgotten here. As welcome as any aid may be, what area residents hope for most is that such a deadly and frightening storm never again takes place. Two fundraising events have been organized by members of the foreign community as disaster relief for victims of the July 28 hailstorm. The first fundraiser is hoping to provide relief to local residents hit hardest by the storm and least able to pay for repairs. Damages include medical bills, car and roof repairs, etc. The second fundraiser aims to provide assistance to Hope House, a home for abused, neglected or abandoned boys, located in Agua Escondida, a subdivision across the highway from the town of Ixtlahuacan. Founded 16 years ago, Hope House suffered damage to solar panels, light fixtures, windows, skylights, the facility’s aquaponics greenhouse, and more. To view photos and a full list of damages, go to Facebook page Hope House CasaHogar UnaEsperanza. To make a donation, visit Upscale Resale bazaar, Hidalgo #75 in Riberas del Pilar (just east of Clinica Maskaras) or go to the Hope House web site. ABOUT THE AUTHOR: Adelle Morgan-Cordero has lived in Ixtlahuacan de los Membrillos for 25 years. She is a former U.S. daily newspaper editor and currently serves as editor of Imagen’s publications, including Best of Lake Chapala. Adelle, her husband Marcos, and Adelle’s sister Tarra Sabin (also a contributing writer for Best of Lake Chapala) were all eyewitnesses to the event described in this article.